The journal aims to provide a comprehensive overview of the business and management by including all the key areas within the field of business administration including human resource management, business economics, laws & ethics, corporate social responsibility, finance, accounting, marketing etc. 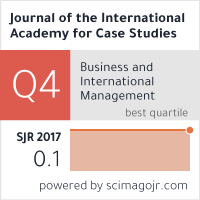 Sponsored by the international academy for case studies, the journal enjoys the rare distinction of offering exclusive cases with teaching case which can be used for class room discussion in business schools. The journal thus encourages authors to contribute case studies on subject areas including but not limited to: management, marketing, leadership, international business, public administration, finance and accounts, organizational behavior, entrepreneurial ecosystems in developing economies, the evolution of banking system, banking case studies - money laundering, anatomy of a scandal, lessons from the financial crisis, retail banking, great recession, monetary policy, quality and safety attributes, business laws, corporate social responsibility, training & development, six-sigma projects, strategic investment, evaluating financial and social returns for investors, game-changing technologies, asset allocation principles, e-feedback,creative promotions, ethics cases, minority enterprises, unfair labor practices, tax exemption, technology integration, gaming and economic development, corporate culture, gender discrimination at work places, and accounting information systems. 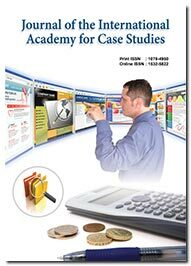 Authors are requested to submit Case Study along with class room Teaching Notes for the relevant article. These cases can be library or field based, or illustrative. For more information about case writing, please refer the editorial policy guidelines and resources page. More details on the types of manuscripts published and the categories of research accepted are displayed in the journal matrix section of this website. Authors who would like to discuss the potential interest in a manuscript may contact the editorial staff.